Hey guys I hope you all had a great weekend and now prepping up for your busy week ahead. I had a super mini vacay this weekend with my Hubby and my Babies which was busier than work. Though it was very busy, it was super fun, productive and adventurous. Oh babies meaning my kitties, here in this post featuring Stitch my handsome boy. 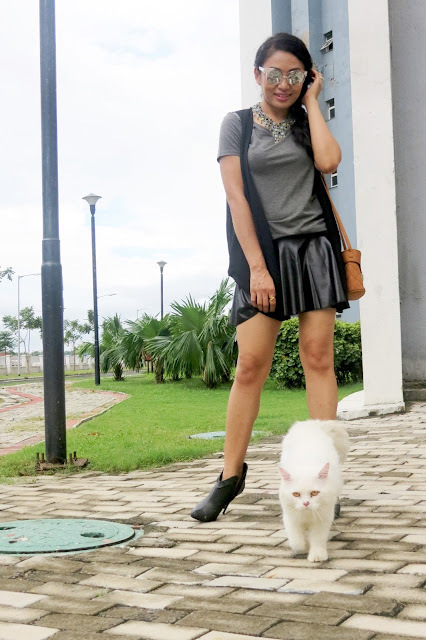 This post also features this gorgeous edgy pleather skirt from Zaubermoda an Instagram Fashion one stop shop in India. Guys now when I said Zaubermoda is a one stop shop I seriously mean it. Do follow them in Instagram and you will know why I said this. Their wide range of collection includes both accessories and apparel. You will be amazed to see their fresh new, high quality and high fashion additions everyday. I know you must be now thinking if it is high quality and all that stuff then you must be ready to dig a hole in your pockets. Let me tell you, If you see their price range you will be even more amazed at the affordable range of collection they have. I am totally convinced with them and hence thought you will love them too. So guys do check them out. For this post today I tried to create a very edgy-relaxed-urban-chic look. I am sure I will get many more looks and lot more wears out of this skirt.